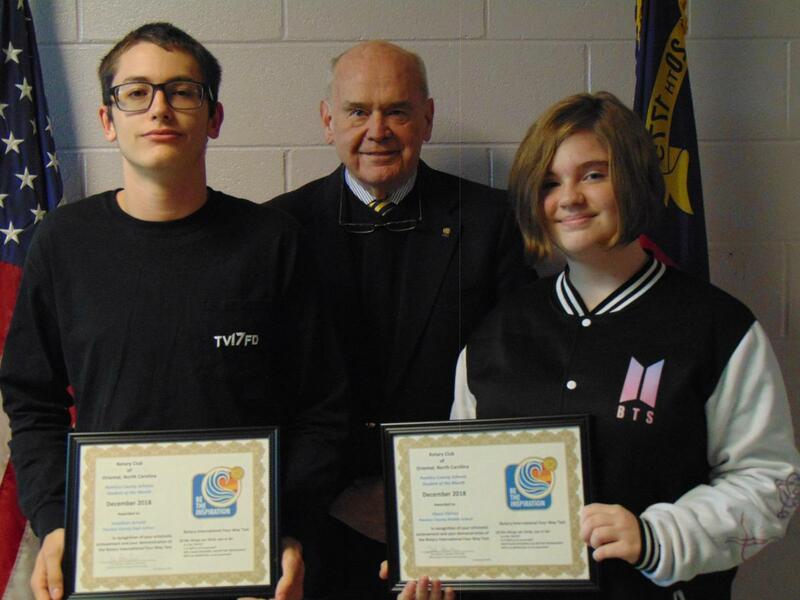 During the January meeting of the Pamlico County Board of Education, Pamlico County Middle School (PCMS) student, Elena Vilches, and Pamlico County High School (PCHS) student, Jonathan Arnold, were recognized as the Oriental Rotary Students of the Month for their school. Elena has been chosen for this award based on her strong work ethic, her motivation to learn, and her willingness to go above and beyond. Elena has shown growth in all academic areas and has become a very confident student who gives 212 degrees of effort in all she does at PCMS. Her teachers know they can count on Elena to follow directions, work independently, and ALWAYS do her best. She is a positive leader in the classroom and is respected by teachers and peers alike. Elena was nominated by sixth grade teachers Eihab Bahhur and Maureen Prendergast. Jonathan comes to biology class everyday ready and eager to learn. He completes each and every assignment to the best of his ability and always participates in class discussions and labs. He has a pleasant disposition, is polite and very respectful to adults and peers. Jonathan is very deserving of this honor. Jonathan was nominated by his teacher, Christine Wayne. Picture: (left to right) Jonathan Arnold, Larry Gracie, Rotary Representative, and Elena Vilches.